The hamlet of Priddis, Alberta, is a whistle stop off Highway 22X. Here in the foothills of the Canadian Rockies, on 13 hectares of resplendent natural beauty, is Azuridge—its name a fusion of the words azurite and ridge. Once a private residence, now a 13-suite estate hotel, Azuridge is a hidden gem in the verdant forest lands. 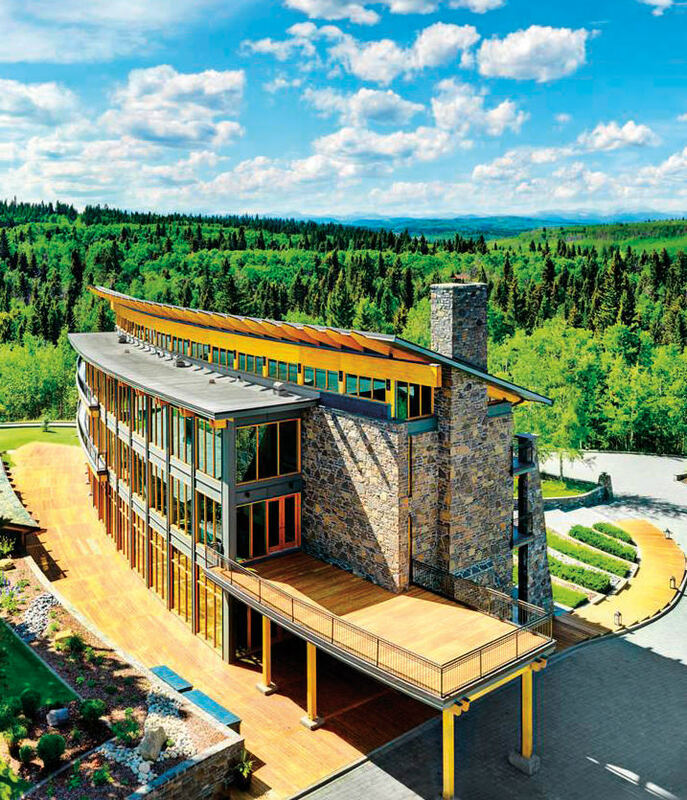 When you’re driving southwest from Calgary, Azuridge is a left turn off the highway through its gates, into the woods, and, after a few hills and valleys, you arrive at the dramatic buildings sitting stately under the widest of azure skies. The architecture—of stone, timber, and sweeping glass—carves the horizon. The design was influenced by the historic design of the Canadian Pacific Railway’s Rocky Mountain train stations, and the indigenous Rundle rock and timber beam construction echoes the design theory of bringing the outdoors in. A home at its heart, Azuridge was once the private enclave of Calgary entrepreneur Mogens Smed. After a $5.1-million refurbishment, the property reopened in January 2012 as a hotel. The estate staff will cater to your every need, and chef Alois Multerer will cook casual or elegant meals for you, the cuisine tailored as you please. The property has quickly become a favourite: for the golf aficionado, who, as an Azuridge guest, has access to the members-only Priddis Greens Golf and Country Club; for the show-jumping enthusiast, who can be at world-renowned equestrian facility Spruce Meadows in 15-minutes; for the cross-country skier, who can enjoy the trails on the property; and for the alpine skier, who can ski Lake Louise nearby. Or simply, for anyone in need of respite in such dramatic seclusion.